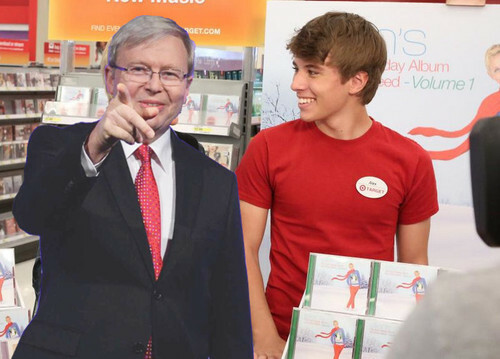 Former Prime Minister Kevin Rudd has been photographed with internet celebrity colloquially known as “Alex From Target.” Mr Rudd, who yesterday attended the funeral of former Labor Prime Minister Gough Whitlam was travelling back to Cambridge Massachusetts where he is a senior fellow at Harvard University when the serendipitous meeting occurred. The media shy former Prime Minister was in the process of what he described as “a pretty routine shopping trip” when he found himself confronted with camera teams from multiple news outlets. After the meeting Mr Rudd described Alex From Target as a “genuine, fair dinkum sort of bloke.” Alex from Target admitted after the meeting at being unaware who Mr Rudd was “He just sort of cornered me and started talking and then suddenly there were photographers there.” Julia Gillard was unavailable for comment.